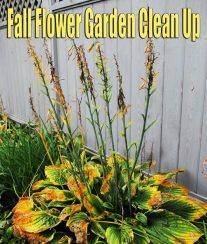 Save the seeds from some of your favorite garden vegetables to replant next year! Here’s our seed-saving guide for beginners. Generally, you will want to make sure seeds are clean and dry before storing them. Below is a rundown of gathering, treating, and storing the most commonly-saved garden vegetable seeds. Saving seeds is cost effective. It makes no sense to buy seeds that you can grow yourself. (You have to be realistic, however. If you don’t have the space or inclination for biennials (such as cabbage), just save seeds for annual vegetables. Saving seeds opens a whole new world of seed trading. At least half the vegetable varieties being grown today have no commercial sources. If you’d like to try them, you have to trade seeds that you have for seeds you want. WHEN IS A SEED RIPE? From a plant’s point of view, ripeness is when the seeds are viable, which is not always when the plant is most edible. Pepper seeds are ripe when peppers are at their full color—depending on variety, this could be red, orange, yellow, purple, or black—and start to shrivel. Tomato seeds are ripe when tomatoes are firm but tender. If you press them, they have some give, unlike the hard feel of green ones. Like peppers, they will also have reached their full color. Summer squash seeds are ripe when the squash is past the edible point, with a hard rind. Then treat the same as winter squashes. Peas and beans are ready when the pods turn brown on the vine and shrink against the seeds. WHEN IS A SEED DRY? Squeeze one seed with pliers or hit it with a hammer. If it’s dry, it will shatter. If it just crushes or feels soft or spongy, then your seeds still need more air-drying before being stored away. 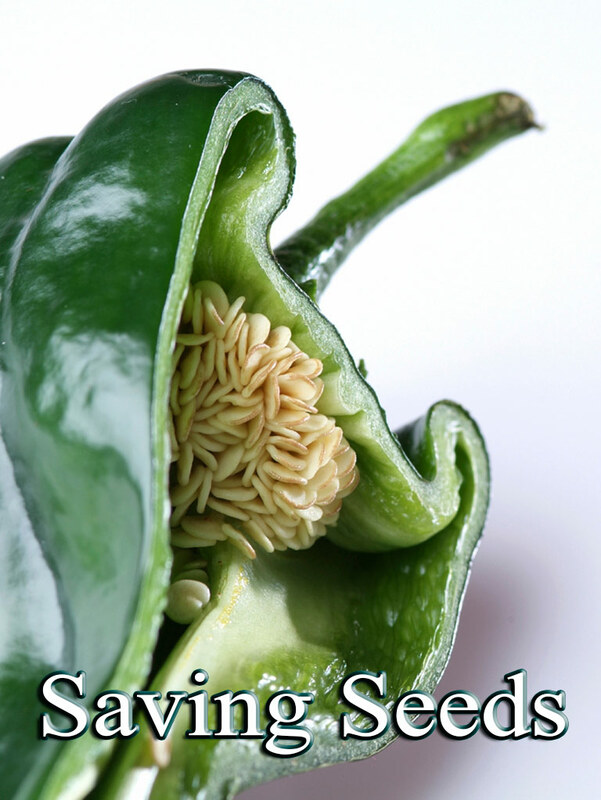 Save seeds only from open-pollinated or heirloom varieties, never from hybrids (which are very common from local garden stores). An open pollinated plant is one in which the offspring replicates the parents. That is, its seeds will breed true to type. Modern hybrids, which are produced by crossing two or more inbred varieties to obtain specific characteristics, will not produce the same variety that you originally planted. If you save seeds from a hybrid, the next generation reverts to the various parents. Sources of open-pollinated vegetables seeds include Johnny’s Selected Seeds, Seeds of Change, Seed Savers Exchange, and Territorial Seed Company. For successful seed saving, you must assure seed purity. This means that plants which readily crossbreed among their own varieties (such as cucumbers, peppers, melons, and squashes) need to be isolated from other varieties of that particular vegetable by distance, caging, or other means. 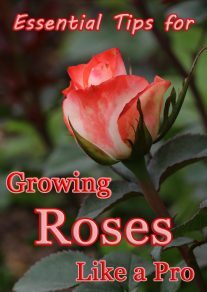 If you’re a beginner, you can make life simpler by just growing one variety of these at a time. As mentioned above, most home gardeners do not have the room to save seeds from biennials, such as cabbages, beets, carrots, cauliflower, onions, and turnips. To do so, you have to harvest the vegetable with the root when it’s ripe, store it over the winter in a root cellar, and replant the whole vegetable the following spring. Whew! Squeeze or spoon the seed mass into a waterproof container (glass, jar, plastic cup, or deli container). Add enough water to equal the volume of the seed mass, and put the container in a warm spot out of direct sunlight. Stir the contents at least once a day. In a couple of days, the viable seeds will sink to the bottom and bad seeds and debris and white mold will float to the surface. Wait five days for all the good seeds to drop, then rinse away the gunk at the top. Wash the seeds in several changes of water, and lay them out in a single layer on a glass or plastic plate or screen. 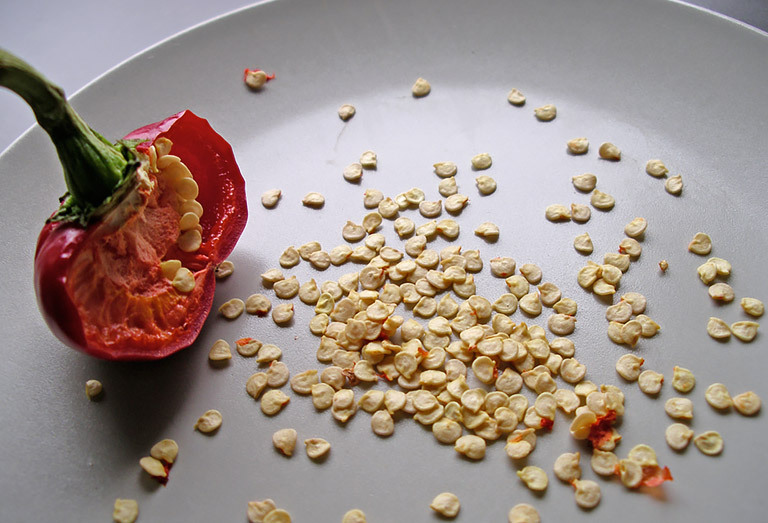 Put the plate in a warm place until the seeds are fully dry, which can take several weeks. Cut peppers open to find the seeds in a mass on the central stem. Brush them off the stem onto a plate or screen. When squashes are ready, break them open and remove the seeds. Hold the seeds under running water, rubbing them between your fingers to remove any stringy material and membrane. Then lay them out on a plate or screen to dry. For watermelons, simply rinse the seeds under running water to remove any traces of flesh or membrane. For cantaloupe and musk melon, seeds will have more fibers and membrane attached to them. Wash this off, rubbing the seeds between your fingers to remove as much as the debris as you can. Then put the seeds in a container of water, and the good seeds will sink to the bottom. Remove what comes to the top, give the good seeds another rinse, and dry them on a plate or screen. Pick the brown pods from the vines and remove the seeds, which will require about six weeks of air-drying. One way is to put them in loosely woven baskets and stir them once a day. If frost or other inclement weather threatens legumes that are ripe but not dry, pull up the vines by the roots, and hang the plants upside down in a warm area, such as your basement or barn. The pods will draw energy from the plants for another few days, which will increase the seed viability. Radishes, lettuce, and Chinese greens also produce seeds in pods after the plant has flowered. With these vegetables, too, it is best to let the pods dry on the plant. These plants, however, tend to dry from the bottom up, a few pods at a time. The dry ones are prone to shattering and spreading their seed all over the ground, so either bag the seed heads—literally putting a paper bag tied at the base over the plants to capture the seeds—or pick the dry pods on a daily basis. Old nylons or row-cover materials work well for bagging because you can still see what’s going on with the plant. Once your seeds are completely dry, they can be stored in any dry, secure container and kept in a cool, dry area. Keeping them dry is very important (as you probably could have guessed by now). For large seeds, such as beans, you can recycle the cardboard canisters that certain snack foods come in. 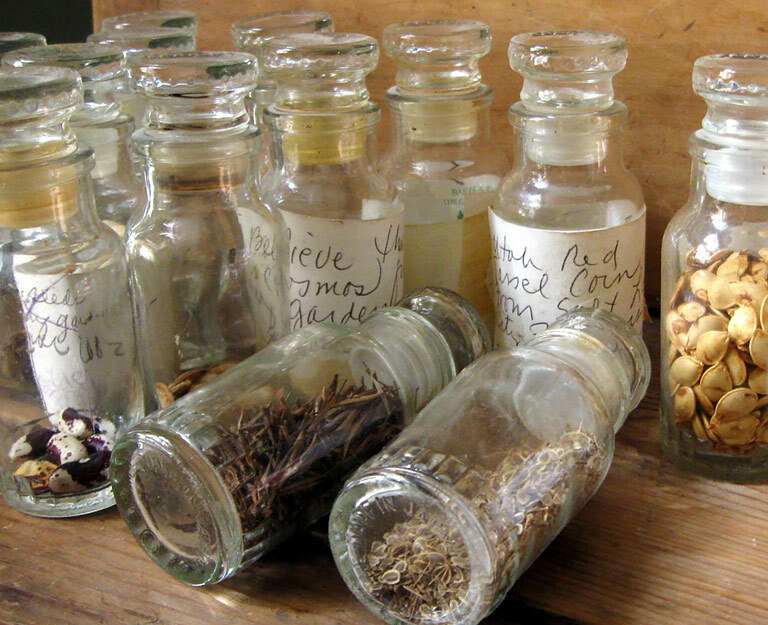 For small seeds, such as pepper and tomatoes, washed-out pill bottles work well. How long a seed remains viable depends on its type and the environment it’s kept in. 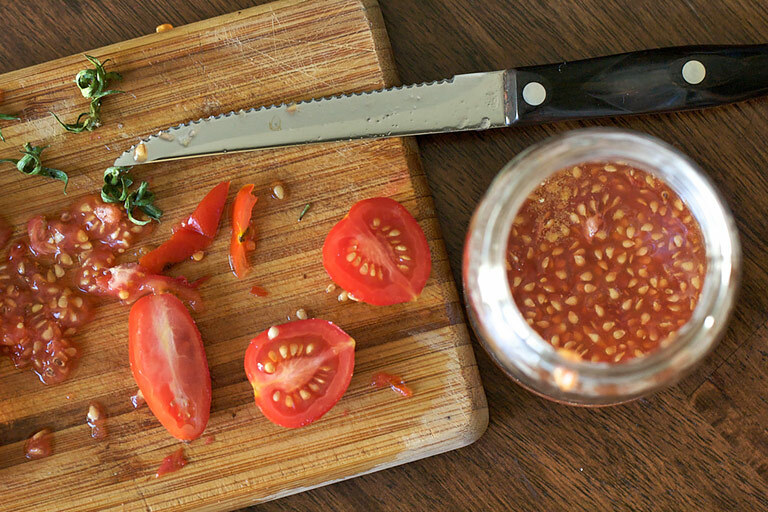 Tomato seeds may last for more than five years, while squash seeds typically last for less time. You can extend seeds’ viability by freezing them, especially if you have a zero-degree freezer. Properly dried and frozen seeds can remain viable for at least 40 years! We hope that you will enjoy saving the seeds from your favorite plants! If you have any tips about saving seeds, please post below, and check out our page on starting seeds indoors.